The closing moments of Monsters Inc. are some of the most beautiful bits of film ever made. Sully opens the Boo’s door. She exclaims, “Kitty!” and all is right in the world. It’s a lovely, quiet assurance they’ll be lifelong friends. When I first heard Disney/Pixar were making another Monsters movie, I assumed it would be the further adventures of Sully, Mike, and Boo. Rather, they took the lovable monster pair back to the past. Mike and Sully weren’t always BFFs. In fact, they didn’t like each other at all. 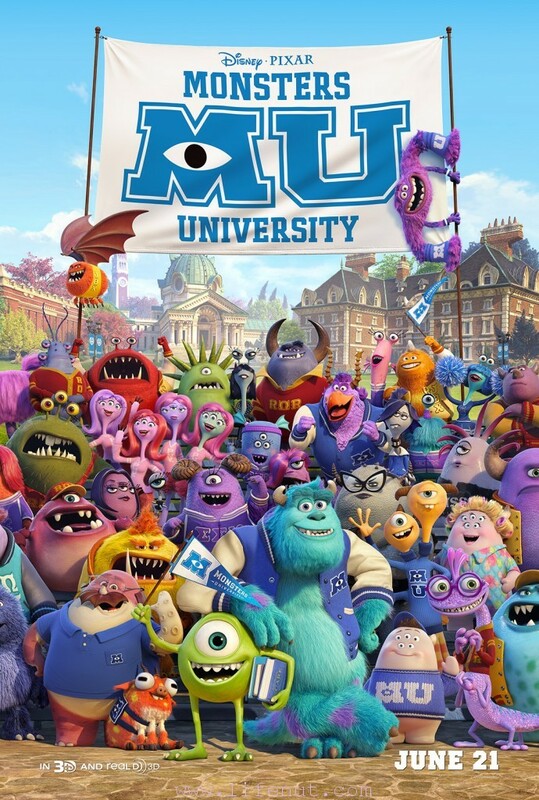 Monsters University follows the antics of all sorts of monsters trying to learn the tricks of their trade. Competition is fierce, literally, for those who want to become the top scarers. Monsters who can’t quite hack the whole ferociously scary side of life can learn how to design doors or manage scream tanks—but those vocations are clearly for the losers. From the time he was just a little one-eyed green dot, Mike wanted to be on the scare floor at Monsters Inc. He has to work very hard at learning to be scary. For Sully, it comes naturally. Tension leads to disaster which leads to redemption and finally, friendship. The story builds slowly. The first half of the movie is lighter in laughs. The focus seems to be on how many crazy monsters they could cram into one frame and how many college cliches they could exploit. There are the jock monsters, the sorority sister monsters, the emo monsters, and the awkward nerd monsters. Guess who Mike and Sully end up with? Guess who must overcome all sorts of obstacles to become the most popular group on campus? It’s Revenge of the Nerds, with fur, scales, slime, and teeth. Most of the big laughs and clever moments come in the second half of the movie. One scene, which takes place in the human world, is truly laugh-out-loud funny. It’s a revelation for all the characters and it’s the big payoff the audience gets to see everyone grow into his leathery skin. Or fur. I appreciated the ultimate message that hard work matters. Talent is important and natural skill can’t be taken away, but what truly makes a monster shine is humility. Mike and Sully end up the stars of the scare floor only after patience and hard work—and facing the consequences of their actions. They both screw up horrendously, embarrassingly. Watching them overcome mistakes is a good lesson for everyone. Monsters University was above average, but not approaching the original’s heart and creativity. Monsters University tried too hard to outdo itself with fantastical montages and characters, forgetting what made the original a masterpiece was its simple heart. Boo loved Sully. Sully loved Boo. I took Ryley, Sam, and Beatrix to the screening and they adored every moment. It’s worth seeing on the big screen, especially during matinee hours. The short before the movie, The Blue Umbrella, is whimsical and sweet, but it’s reminiscent of the short before Wreck-It-Ralph. On the drive home, Ryley pointed it out. I had been thinking the same thing. Confirmation! Monsters University opens everywhere on June 21st! Have fun exploring the real website for Monsters University. Dear old MU. Start writing your admission essay today.